Alphonso Johnson studied bass at the Philadelphia Music Academy with John Lamb, former bassist with the Duke Ellington Orchestra. His touring career began when he was seventeen, and it was at this time that he also began to develop his own style of fusion music. At the age of twenty-one, Mr. Johnson toured the world with the Woody Herman Orchestra, with which he recorded the album The Raven Speaks. He then joined the Chuck Mangione Quartet and played on the album The Land of Make Believe. Wayne Shorter heard Mr. Johnson with the Mangione group and asked him to record the album Mysterious Traveler with the group Weather Report. Mr. Johnson co-wrote two songs for the album and toured with the band from 1975 to 1976, during which time he recorded his first solo album for CBS/Epic titled Moonshadows. A summary of his many touring and performing credits includes: Santana, Weather Report, The Crusaders, Bob Weir, Chuck Mangione, George Duke, En Vogue, Wayne Shorter, Sergio Mendes, Tony Williams, Joe Williams and Gregory Hines. Discography credits include albums and CDs with Woody Herman, Weather Report, Eddie Henderson, Flora Purim, Quincy Jones, Lee Ritenour, Phil Collins, The Whispers, John McLaughlin, Jeffrey Osborne, Sarah Vaughan, Dori Caymmi, Carl Anderson and The Meeting. Mr. Johson has appeared on Don Kershner’s In Concert (with Weather Report), The Arsenio Hall Show (with Santana) and The Johnny Carson Show (with The Meeting), as well as in an MTV Video (with Jeffrey Osborne). He has also contributed a chapter in The Guitar Teacher’s Handbook published by Oxford University Press. 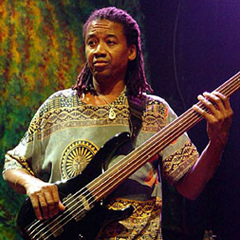 He wrote The Bass Guitar, which was also published by The Oxford University Press in 1994. In addition, he wrote a chapter in Lessons with the Greats, which was published by DCI/Belwin in 1993.